K.R. 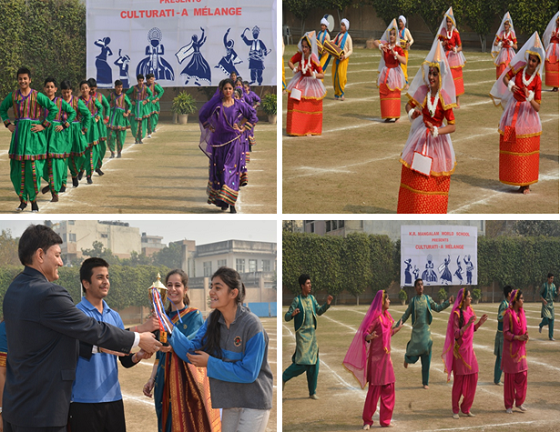 Mangalam World School, G.K.II celebrated its Annual Fiesta ‘Culturati-A Melange’… an artistic splendor, on 30 January 2016. The programme commenced with the sprightly and ebullient contingents of the Army, Navy, Air force and NCC cadres marching proudly with precision, at the beat of the drums, showcasing the true spirit of leadership. The occasion was graced by the benign presence of Shri S.S. Rawat, Regional Officer, CBSE, the Chief Guest of the day, Dr. Stella Kujur, DDE South-East and Management members of KRM Group of Schools. The spirit of harmony and togetherness engulfed the atmosphere as the talented singers presented a soulful melody titled ‘Humse hai Umeede’. Extending a warm welcome to all the distinguished guests, the Principal, Ms. Archana Sagar exhorted the role of students to become the responsible citizens of tomorrow by achieving the three P’s- Persistence, Patience and Practice. This was followed by an invigorating yoga performance, ‘Adwaita- The Art of Well Being’, by the students of class V. Various track events in senior as well as junior categories were held where the athletes of KRM proved their mettle and bedazzled everyone with their speed, stamina and confidence. The Fan Drill, ‘Fanning the Fervor’ was indeed a visual treat as the young learners of classes VI and VII perfectly synchronized the movement of the fans to the rhythm of music, proving right that strength meets flexibility. The much awaited prize distribution ceremony followed up where the worthy Chief Guest bestowed the prizes to the most deserving athletes and meritorious students and motivated all to keep striving hard with sincere endeavors. The overall trophy was bagged by Sapphire House. The function concluded with the students presenting the cultural ethos of Indian Art of Living through the fusion, ‘Montage-The Dances of India’. The riveting performance, a confluence of the various dances won an unceasing applause from the audience. It was indeed a spectacle to watch. The programme culminated with the Vote of Thanks by the senior school coordinator Ms Ritu Sachdeva.